Twenty-five years ago, Nintendo's venerable Nintendo Entertainment System first went on sale in North America. 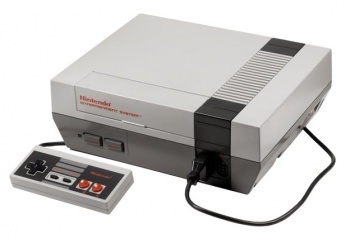 For many gamers, the original Nintendo Entertainment System was where it all began. With a bevy of classic titles running the gamut from Duck Hunt and Super Mario Bros to the original Zelda and Metroid, one could argue that the NES was the most influential videogame console of all time. It certainly pulled the struggling games industry out of its early-1980s crash all but simultaneously - can you imagine where we'd be right now if it hadn't been for Nintendo's little gray box? On October 18th, 1985, Nintendo employees - having moved from Seattle to Hackensack, New Jersey - hit the streets in Manhattan, demonstrating the virtues of the NES in makeshift displays to anyone who would listen. The very first NES unit was sold at the iconic FAO Schwarz store in Manhattan, Nintendo's then-advertising-manager Gail Tilden told 1UP. The lucky buyer - who took home all 15 launch titles like Excitebike and Ice Climbers with the console - turned out to not be a curious consumer after all, says Tilden, but rather a representative from a competitor in Nintendo's native Japan. Though Nintendo considers this initial October 18th street test the NES' birthday, the console wouldn't see widespread release across North America until 1986 following a similar (and similarly successful) test in Los Angeles. It launched in Europe the same year, and enjoyed a very successful reign around the world until it was finally discontinued in 1995 - a year before Nintendo released the Nintendo 64. Happy birthday, NES. You turned a generation into gamers, and there is little praise we can give you that is worthy of that achievement.